If you are excited to read this book, you have issues. Do you understand the weight of what we are about to consider? We are exploring the possibility that you and I may end up being tormented in hell. Excited would be the wrong term to use here. Necessary would be more fitting. For some, this discussion will open up old wounds. It certainly does for me. The saddest day of my life was the day I watched my grandmother die. When that EKG monitor flatlined, I freaked out. I absolutely lost it! According to what I knew of the Bible, she was headed for a life of never-ending suffering. I thought I would go crazy. I have never cried harder, and I don't ever want to feel like that again. Since that day, I have tried not to think about it. It has been more than 20 years. Even as I write that paragraph, I feel sick. I would love to erase hell from the pages of Scripture. How about you? Have you ever struggled with hell as I have? Do you have any parents, siblings, cousins or friends who, based on what you have been taught, will end up in hell? What a bone-chilling thought. Until recently, whenever the idea of hell—and the idea of my loved ones possibly heading there—crossed my mind, I would brush it aside and divert my thinking to something more pleasant. While I've always believed in hell with my mind, I tried not to let the doctrine penetrate my heart. However, I reached a point where I could no longer do this. I could no longer acknowledge hell with my lips while preventing my heart from feeling its weight. I had to figure out if the Bible actually taught the existence of a literal hell. How great would it be if it didn't? Then I would be able to embrace my grandmother again someday. So I decided to write a book about hell. Honestly—I'm scared to death. I'm scared because so much is at stake. Think about it. If I say there is no hell, and it turns out there is a hell, I may lead people into the very place I convinced them did not exist! If I say there is a hell, and I'm wrong, I may persuade people to spend their lives frantically warning loved ones about a terrifying place that isn't real! When it comes to hell, we can't afford to be wrong. This is not one of those doctrines where you can toss in your two cents, shrug your shoulders, and move on. Too much is at stake. Too many people are at stake. The Bible has too much to say. Part of me doesn't want to believe in hell. I'll admit I have a tendency to read into Scripture what I want to find—maybe you do, too. Knowing this, I've spent many hours fasting and praying that God would prevent my desires from twisting Scripture to gratify my personal preferences. I encourage you to do the same. Don't believe something just because you want to, and don't embrace an idea just because you've always believed it. Believe what is biblical. Test all your assumptions against the precious words God gave us in the Bible. There are many things I believed and practiced for years, only to change my views after further study of the Bible. I've learned to be OK with saying, "I think I was off on that one." While this is humbling and difficult, it's better than continuing to believe something that is inaccurate. For example, I was initiated into the American church when people urged me to pray a prayer to receive Christ so I wouldn't burn in hell. After years of leading others down the same path, I changed. I now speak against this idea of simply praying a prayer as fire insurance—I just don't see it anywhere in Scripture. I was also taught that the Holy Spirit no longer empowers our lives with miraculous deeds, because these ceased long ago. For many years, I discouraged people from pursuing the supernatural. After further study of Scripture, I now believe the Spirit can heal the incurable, accomplish the impossible and ignite believers to do greater works than Jesus (John 14:12). I urge people to believe the same. I have distanced myself from traditional forms of church in pursuit of what I believe is more biblical. I don't believe God wants our church life to be centered on buildings and services. Instead, God wants our churches—whatever specific forms our gatherings take—to be focused on active discipleship, mission and the pursuit of unity. At one point, I even sold my house, quit my job and left the country because I didn't want any of my comforts to hold me back from pursuing God wholeheartedly. I wanted to follow God wherever He led me. I'm not going to hang on to the idea of hell simply because it's what my tradition tells me to believe. Neither should you. Let's be eager to leave what is familiar for what is true. Nothing outside of God and His truth should be sacred to us. So it is with hell. If hell is some primitive myth left over from conservative tradition, then let's set it on that dusty shelf next to other traditional beliefs that have no basis in Scripture. If it is true, if the Bible does teach that there is a literal hell awaiting those who don't believe in Jesus, then this reality must change us. It should certainly purge our souls of all complacency. As we roll up our sleeves and dig into the topic of hell, it's important that you don't distance what the Bible says from reality. In other words, don't forget the doctrine you are studying may be the destiny of many people. Hell should not be studied without tearful prayer. We must weep, pray and fast over this issue, begging God to reveal to us through His Word the truth about hell because we can't be wrong on this one. This book is actually much more than a book on hell. It's a book about embracing a God who isn't always easy to understand, and whose ways are far beyond us; a God whose thoughts are much higher than our thoughts; a God who, as the sovereign Creator and Sustainer of all things, has every right to do, as the psalmist says, "whatever He pleases" (Psalms 115:3). God has the right to do WHATEVER He pleases. If I've learned one thing from studying hell, it's that last line. Whether you end up agreeing with everything I say about hell, you must agree with Psalm 115:3. Because at the end of the day, our feelings and wants and heartaches and desires are not ultimate—only God is ultimate. God tells us plainly that His ways and thoughts are infinitely higher than ours (Isaiah 55:9). Expect then, that Scripture will say things that don't agree with your natural way of thinking. "God, I want to know what is true. I know I have cravings that sway and distort my ability to reason. You promise that Your Holy Spirit will guide me into all truth. I pray He will now. I don't want to be wrong. I don't want to be deceived by others or myself. You alone possess all truth, and I want to be on Your side. Give me eyes to see and ears to hear. Give me courage to live and speak what is right no matter the cost. I don't want to believe anything about You that is not true. Amen." Copyright 2011 Francis Chan. 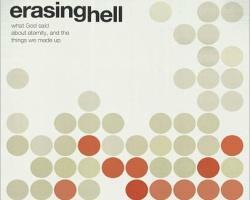 Erasing Hell published by David C. Cook. All rights reserved. Publisher permission required to reproduce in any format.